Successfully Added Quad Band Dual SIM Cellphone - Scarlet Motion Media Edition to your Shopping Cart. Quad band dual SIM cell phone with standard headphone jack for using your favorite pair of headphones. This media rich touchscreen phone also has additional on board stereo speakers for optimum sound performance. 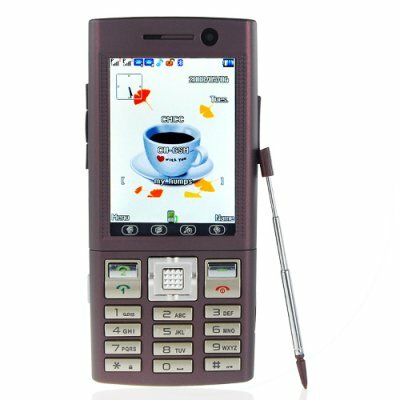 This mobile phone is designed to let you access the media features and the on board camera with ease by using the side buttons and touch screen functions. With the addition of its motion sensor you can give the phone a simple shake and it will move between music clips, videos, pictures. This mobile phone comes in an extremely unique scarlet color, making it very fashionable with a smooth feel all around. The unique mobile phone comes with digital camera lenses on both the back and front of the phone with flash support for the back camera. This front camera is very handy when trying to take a self portrait to MMS your friends, girlfriend or boyfriend. Built with a very special feature for music fans, the scarlet media edition comes with on-board stereo speakers and a 3.5mm jack so you can use your favorite earphones and enjoy brilliant stereo sound when listening to your MP3's. While this cell phone has wonderful multimedia features, what really makes it stand out is its ability to utilize both SIM cards. When making a call, simply dial the number you wish and press line one or line two, and if using the touch screen feature to make a call, you have two separate call line icons making using two SIM cards while on dual standby as user friendly as possible. This phone will never cease to impress, with addition multimedia functions to keep you entertained where ever you are in the world, watch analog TV, listen to FM radio, fill your 1GB micro SD card with hours of music and videos and you will never be board again! Headphone Jack - GREAT FOR MUSIC!!! Quad Band (use it around the globe). Dual SIM cell phone (great for world travelers and playboys). Motion control lets you control features by the shake of your wrist. Does this quad band dual SIM unlocked cell phone come with a digital TV tuner as well? No, the cell phone only comes with an analog TV tuner. Does this phone have Portuguese language? The phone comes with a default selection of languages. If you need any other language and plan to order a large quantity (25+ pieces) then we may be able to supply the phone with your language. If you just need a smaller quantity, then let us recommend another version which has Portuguese language (Quad Band Dual SIM Unlocked Motion Cellphone - CVCY-M19).